This is the inspiration for CR84FN46 - Lt. Pink, Yellow and Neutral. Below is my card. 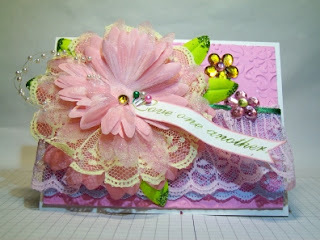 I chose to make a wedding card for a friend of ours who got married in Thailand in December 2011. I was waiting until after they returned from their honeymoon to ask what they needed/wanted as their wedding gift. This is what the groom, our friend, said to me, "We are abundantly blessed. We only need a beautiful card." Isn't that just the sweetest thing?! So here I am presenting you with Sanon & Veena's wedding card. I was presented, from my mom, a bag full of beautiful laces in yellow, pinks, light blue, and ecru. So what I used on my card is the lt. pink, lt. blue, pale yellow and some of the green satin ribbon that was also in the bag. 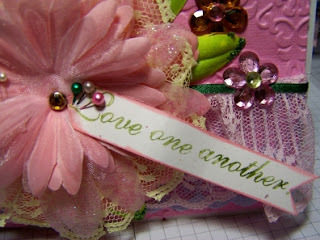 I embossed the pink panel cardstock. Added some flower rhinestones and some glittery leaves. I added a little loopy string of pearls to the flower. My sentmient was a little diffcult to read in the above picture so here it is again. It says, "Love one another." I'm really proud of this photo as for about two years I ahve been trying to take closeups with my camera and had so many failures I had given up. I think I whipped it this time. I actually had some great lighting (one of my Christmas pressies from the hubs) and used the timer on the camera. 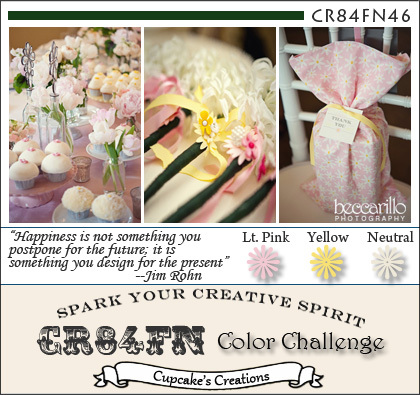 Anyhoo, if you'd like to play along with the gals at CR84FN, just pop on over there and follow the rules. Hope you like my card! Be sure to check out my kit I am selling HERE. But hurry, the deadline to purchase is February 4, 2012. Betty, I think you came through with the BEAUTIFUL card! FAB flower and layers of goodness! THX for playing with us at CR84FN! What a fabulous card - the flower is amazing!! I'm sure your friends love it, and the sentiment is perfect. Thanks for playing along with CR84FN!